Nicotinic acetylcholine receptors (nAChRs) modulate the neurobiological processes underlying hippocampal learning and memory. In addition, nicotine’s ability to desensitize and upregulate certain nAChRs may alter hippocampus-dependent memory processes. Numerous studies have examined the effects of nicotine on hippocampus-dependent learning, as well as the roles of low- and high-affinity nAChRs in mediating nicotine’s effects on hippocampus-dependent learning and memory. These studies suggested that while acute nicotine generally acts as a cognitive enhancer for hippocampus-dependent learning, withdrawal from chronic nicotine results in deficits in hippocampus-dependent memory. Furthermore, these studies demonstrated that low- and high-affinity nAChRs functionally differ in their involvement in nicotine’s effects on hippocampus-dependent learning. 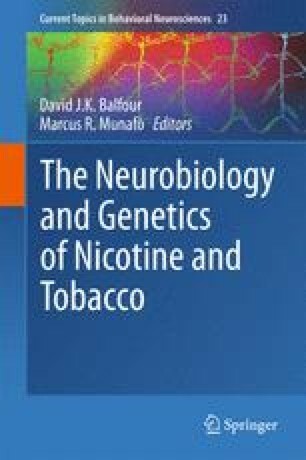 In the present chapter, we reviewed studies using systemic or local injections of acute or chronic nicotine, nAChR subunit agonists or antagonists; genetically modified mice; and molecular biological techniques to characterize the effects of nicotine on hippocampus-dependent learning. This work was funded with grant support from the National Institute on Drug Abuse (T.J.G., DA017949).